For those of you with student loans, you may have noticed that your unsubsidized loans have already started to accrue interest while your subsidized loans have not. This is because subsidized loans are need-based loans that don’t accrue interest during deferment. On the other hand, unsubsidized loans begin accruing interest when they are disbursed. Even though you don’t have to start paying the interest that has started accruing on your unsubsidized loans until you have your grace period has passed, it helps in the long run if you do. In this example, a student takes out a $5,000 unsubsidized loan with an interest rate of 3.76% during their freshman year of college. After four years, the student graduates college and then takes advantage of the six month grace period before paying back any of the interest or principal on the loan. 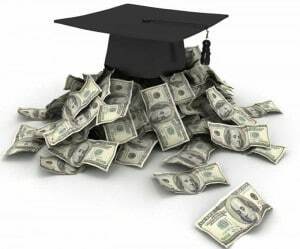 During that time, the student accrued interest of $846 on the loan, increasing the loan balance to $5,846. If the student uses the standard repayment plan, which is the loan balance divided up into 120 equal monthly payments over 10 years, then the student will have to pay a total of $7,036 in repaying the loan. Now, let’s say that the student paid the interest that accrued during deferment of $846 before the grace period ended, keeping the balance of the loan at $5,000. If the student uses the standard repayment plan, then the student will have to pay $6,018 to repay the loan, bringing the total amount spent on the loan to $6,864. By paying the interest that accrued during deferment before the end of the grace period, the student will save $172 by the end of the repayment. That student was able to save $172 by paying the interest that accrued on the unsubsidized loan during deferment because of avoiding capitalization. Capitalization on student loans is when the loan servicer adds the interest that accrued during deferment to the principle balance of the student loans. By doing this, when it comes time to repaying the student loan, the student will then have to pay interest on the principal and the interest accrued. Therefore, the student will be paying interest on interest. While it may seem like the student in our example didn’t end up saving much in the long run because it was only $172, the student only borrowed $5,000. Our example student’s loan debt is extremely low compared to the average student. According to Student Loan Hero, “the average Class of 2016 has $37,172 in student loan debt.” This means that the average student has over seven times the amount in student loans than the student in our example. As the amount of loan debt increases, the more important it is to avoid capitalization. Finally, make sure you attend Spring Break NOT Spring Broke on Thursday, March 3rd. Powercat Financial Counseling will be hosting this fun and beneficial event at the Rec from 4:00-6:00pm. There will be games and information to learn even more tips on saving money during spring break as well as a chance to win one of six Magic Bullet Blenders along with other prizes! Also if you would like to start a budget for spring break, or have any other financial related questions, make an appointment with Powercat Financial Counseling and one of our peer counselors would love to sit down and meet with you. Just go to www.k-state.edu/pfc and click on “request an appointment” link on the homepage. We hope to see you in, and have a fun and relaxing spring break!